Horiguchi-san designed the characters and checked the TV-series drawings as chief animation director. Here we talk to her about how she upgraded the fine details of the drawings while maintain the same atmosphere of the TV series. – Please tell us your thoughts when you first heard that K-On! was being made into a movie. – While you were working on the movie, what did you talk with director Yamada about? The director and I both loved having our various strategy meetings regarding patterns, designs and other things. We had many talks about what would be best for making the series into a movie. There were various ways we came up with to not lose the atmosphere of the TV series, but to not nonchalantly upgrade the artwork. Things like slightly increasing the body proportions or adding shadows…. We really changed it to feel like you’re watching real girls. Incidentally, though this isn’t about the drawings, the color of the girls’ blazer changed to be a bit blacker than the TV series. – As you were working as chief animation director and as a unit animation director, what did you keep in mind while working? – What changes did you make to the character designs and the drawings between the movie and TV series? Fundamentally the designs weren’t that changed, but they felt redone for the movie. If you change them too much, the fans wouldn’t be happy. I was always worried while working about how much seasoning they should get with the additional lines. If you improved the quality of one drawing too much, then the work itself would feel different. They’re more beautiful than before, but still beautiful girls…like that? – The movie had a lot of foreigners appear in the story. Could you tell us what points you focused on while designing those characters? I had the privilege of going location hunting and I was shocked at how taller the foreigners are and how big their feet are! It’s a huge mystery to me how humans can be so different in body shapes and we’re still the same. (laughs) If they were to be lined up with the girls, you’d see the difference in face length and body length. I wanted to pin the dimensions so that there wasn’t an uncomfortable feeling when you see them. Going on the location hunting trip was a good experience because it allowed me to maintain that atmosphere and put it as it is. – What were the objectives when designing the clothing and suitcases for the light music club members? Yui has that strangely cute style, Ritsu is lively yet fashionable, Mio has that simple and secure look, Mugi has refined fashion and Azusa feels like a cute girl. Incidentally, the designs for Yui and Ritsu’s clothing on the second day were really drafts from the director… Definitely the fashion for delinquent leaders. (laughs) The suitcases and other small items were designed by the accessory designer Takahashi-san to match the characters. – How were the animation director assignments organized? The movie was divided into 4 general parts: A-d. I was in charge of the A and D parts, both in Japan. By the way, the B-part was Miku Kadowaki-san and the C-part was Kazumi Ikeda-san. Both are animation directors well familiar with the TV series, so I felt safe leaving it to them. – What are your favorite scenes or any that you particularly focused on? It definitely had to be the concert scene in the D-part. As we were heading to the end of the D-part, the director spontaneously said “Wait, the D-part is way too important!” for some reason I didn’t understand. (laughs) I worked on that part with an “I’m not dying here!” enthusiasm for that part alone. I really like the portions where Yui dives into the crowd of classmates and when she and Mugi hop at the end of the performance. – Please tell us your other favorite scenes outside those parts. I really love that nervous excitement you feel, but can’t put into words, that was in the air when they were leaving their houses until they got on the plane to London. Also how about that scene in the conveyer belt sushi restaurant? Ric-chan’s Japanese-English and Yui’s comebacks were so cute. So cute. The London part was so fun and I love it so much. 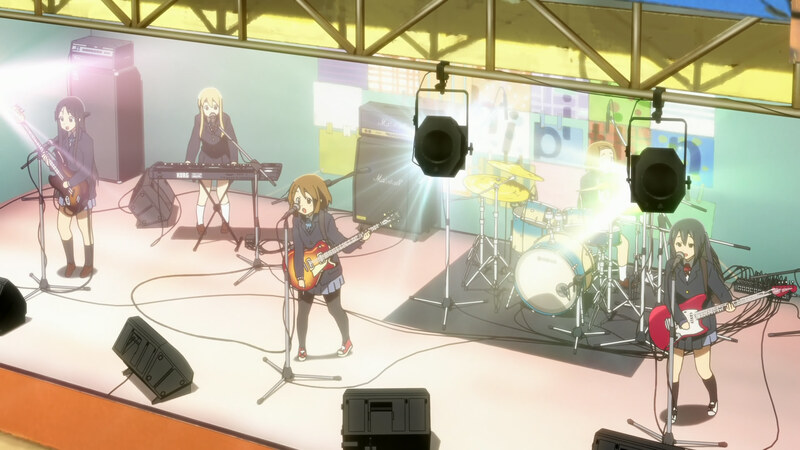 – Please tell us your impressions over the three years working on K-On!. When you say three years, it feels like it’s been a long time, but the experience feels like we’ve been with the girls for much much longer. 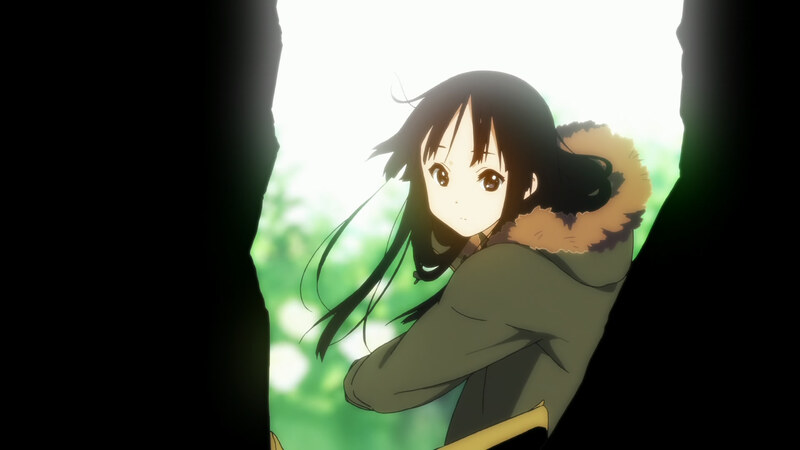 Both the director and I look back at all the events we’ve had related to K-On! and think it must have been fated somehow (though not greatly fated). I really can’t think of any regrets I have on the series. It feels like we’ve separated ourselves from this work. And also I feel thankful. It wasn’t just full of fun things; naturally there were a lot of difficult moments, but they’re all fond memories. It was definitely fun. Thank you for letting me work on it! – Please give a few words to the fans. K-On! was planned to end after one cour, but thanks to the love from all the fans, we were able to make a second season and a movie. It would make me truly happy if all the fans continued to feel warm and happy about the series 20 or even 70 years from now. Thank you all for watching! Yukiko Horiguchi Animator at Kyoto Animation. Notable works include working as character designer/chief animation director for Tamako Market and Lucky Star. This entry was posted in K-On!, Kyoto Animation, Translations and tagged character, chief animation director, designer, horiguchi, k-on, movie, Translation, yukiko. Bookmark the permalink.